In 2010, FotoInsight introduced the first photo Advent calendar. Cambridge. 11 Oct 2018. - FotoInsight® now offers the popular photo Advent calendars in portrait format, too, as most mobile phone pictures are taken in portrait format. The photo Advent calendar is the ideal place for the year’s most beautiful photographic memories and a perfect gift. - Ferrero® Photo Advent Calendars from £19.99 / €24,99 with a selection of chocolates Ferrero Küsschen®, Ferrero Rocher® and Raffaello® in sizes A4 and XXL in portrait or landscape format. - kinder® Photo Advent Calendars from £18.99 / €19.99, with chocolate surprises kinder chocolate®, kinder Country®, kinder Bueno® and kinder chocolate Bons® in sizes A4 and XXL in portrait or landscape format. - Self-filling photo Advent calendars in XXL size 48 × 36 × 3.5 cm, in portrait or landscape format. - Chocolate Free Photo Advent Calendar from £7.49 / €8,99, with 25 landscape images in sizes A4 (35 x 24 cm) and A3 (42 x 29.7 cm) in portrait or landscape format. 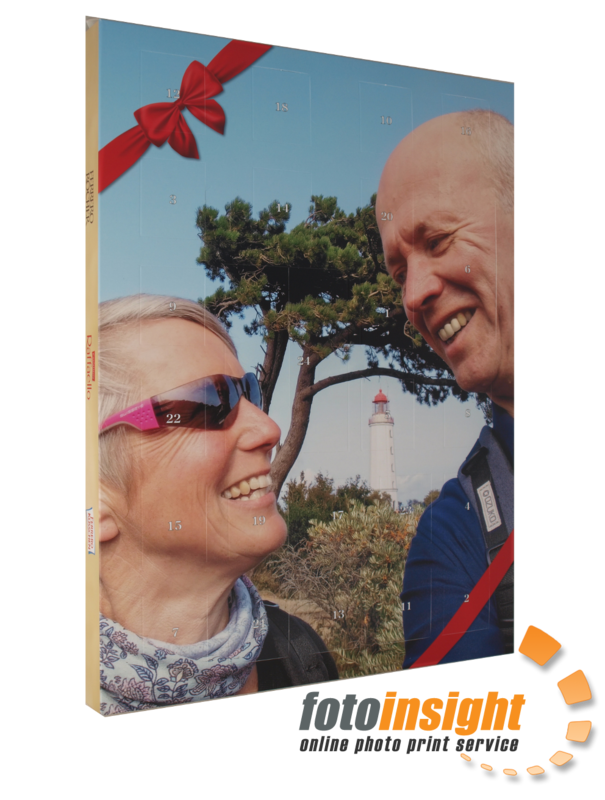 Photo Advent calendars by FotoInsight are made of high-quality opaline with a satin-matt surface and are printed digitally. Advent calendars with own photographs are available in the UK from £7.49 (plus delivery) at http://fotoinsight.co.uk/photo-calendars.html and in Ireland from €8.99 (plus delivery) at http://fotoinsight.ie/calendars.html. FotoInsight Ltd was founded in Cambridge in 2003. The online photo service FotoInsight prints pictures and personalized gift ideas with photos, such as personalized photo calendars and photo books. In 2010, FotoInsight introduced the first photo Advent calendar. With a steady growth in the photo book and photo calendar offering, the online printer has expanded its range of personalized Advent calendars year by year. If you would like to write about FotoInsight and need pictures or wish to test our photo calendar or photo book service, please don’t hesitate to call us on 0208 1449369 or email pr (at) fotoinsight.co.uk . FotoInsight also offer vouchers and software for reader offers. This press release was distributed by ResponseSource Press Release Wire on behalf of FotoInsight Ltd in the following categories: Children & Teenagers, Leisure & Hobbies, Consumer Technology, for more information visit https://pressreleasewire.responsesource.com/about.